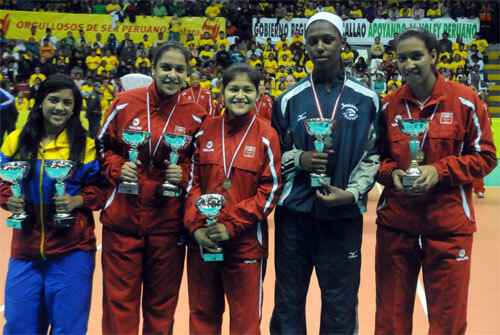 LIMA, Peru, June 21, 2011 - Brenda Uribe, the Peruvian top scorer in the final match her team won over Dominican Republic in front of a sealed crowd at Miguel Grau Coliseum on Tuesday, was selected as the Most Valuable Player of the U-20 Women’s Pan American Cup. Uribe was also the best attacker while her teammates Alexandra Munoz (best server and setter) and Maria Acosta (best receiver) were also awarded. Mexico’s Samantha Bricio resulted in the best scorer and Dominican Candida Estefany Arias was the best blocker. Venezuela’s Genesis Duran, was the best digger and libero. Final positions: 1. Peru, 2. Dominican Republic, 3. Cuba, 4. Mexico, 5. Venezuela, 6. Costa Rica, 7. El Salvador.